Give your favorite little dancer a bedding set that reflects their interest with this three or four-piece comforter set. Pink ballerinas dance across Lullaby's 200 thread count printed cotton comforter set. This set is made with 100-percent cotton so it's easy to clean and durable. This was the perfect bedding set for my daughter's room. The items washed up very well. The comforter is fluffy, yet lightweight. Very happy with this purchase. Just as described. Beautiful crisp 100% cotton bedding. Daughter loves it and the best part it's all cotton, none of that polyester *** . Would definitely recommend this item. 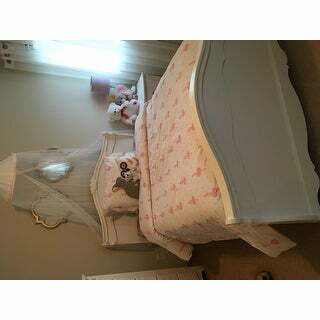 Nice comforter set for Granddaughter's bed. Love the set! The only problem was that one of the sets I ordered came missing the pillow case. Called overstock custume service and they never delivered the pillow case. Washes well and such great quality! My daughter loves her comforter! Looks expensive. Bought this for my girls! They love it and so do I! Very nice quality! Perfect for a ballerina themed room! It’s simplicity and feminine touch. I can’t wait to set my daughters room. Great quality product! Worth every penny! My. granddaughter investors the ballerinas on her cover. It looked really beautiful in my daughter's room. "Is this a comforter or does it require me to purchase a duvet insert ?"